EPBOT: Coin Purse Tutorial & Give-Away! So cute - even without the ears!! Wow Marilou! Those are amazing! And while the traditional Epbot is who we all know and love, I think he is (almost) as adorable without ears! Fantastic job! Since I have absolutely no craft skills to recreate one myself, the only hope I have at getting something so cute is to win one (insert shameless begging). I don't have any fun craft projects to share, but I'm assigning my students (I teach college English) a process analysis (basically a how to) paper, and I promise if I get any fun crafts, I will send them to you! I also get all kinds of yummy recipes if anyone wants! PS- the word verification is telling me to write "twele"...I think they forgot the "v". Who wouldn't wanna give him a home, ears or no ears? Super cute and unique without the ears! Super cute! I wish I had that kind of crafty talent. That is just the cutest thing! The little details are so well made, too. Ears no ears, cute either way! Adorable! Count me in one the contest. Wow, this is so adorable and so creative! Ok even if I don't win I'm totally making one these purses! Totally adorable! I love the tilt of the head. So cute! So adorable!! What unique pieces. What a great pick me up for the kick off to this incredible tough week of nursing school! You post some great stuff! OO Fun!! It would look awesome hanging off my new Ipad bag! This is awesomely cute :) You are one of my creative heroes!!! D'aw! I think it is cuter without the ears! So aborables and awesomes with or without earsies!! So cute! I'd love to have one! Awww, too cute! I didn't even notice the missing ears til you mentioned it. Aw, how cute! And the claybot is especially awesome! Yeah totally putting my name in for that. So cute! Awww! I think he's adorable! Wish i had that kind of talent!!! They are awesomely cute! All the better not to hear the money disappearing with, my dear! Cute & change! too cute for words! loves it! Aww... Totes adorbz is right! I wish I had more time and money for crafting things like this! So adorable! Ooooooo! They're all soo cute, missing ears and all! I would be quite excited to win something of such adorable-ness! I'm that little kid wriggling around in my seat in the front of the class with my had in the air that the teacher refuses to call on because I've answered every question so far. Oooooo oooo oooo meee! me! me! me! So adorable! So slightly Island of Misfit Toys! So awesome! Aww, he looks adorable! and I've been looking for a little something to hold all my laundry quarters in! Everything is perfectly cute, bot-ears or no-bot-ears!!! How freaking adorable!! What a clever idea. I think I'm gonna follow the tutorial and make other things with this cute idea. So very cute! Thanks for giving away the extra one, even if I don't win. But I hope I do!! Pick me!!! I love cute things!!! It's what I live for!!! So adorbz! It would look great with my silvery purse! very cute. so consider this a comment. p.s. did you hear about firefly coming back on syfy? and/or the push to fundraise for nathan fillion to purchase rights to the show? Speaking of cute and giveaways, I have one going on too! Anyone who's interested in adorable crocheted dishcloths should head over to http://stitch-witchery.blogspot.com. I would love to have this as an accessory to take to the WildWildWest Steampunk convention in a couple of weeks. How fun to take out little 'bot to pay for a cup of tea. Awwww. I love the way (s)he just hardly fits on the side of the purse... Besides, I just happen to really really need a new coin purse asap. Honest. Adorable--even if he can't hear me say it! So cute, would love to have it in my purse! Fmmmmmmmmmmmmmmmmmmmmfh! Thats the cutest thing EVAH! I might have to make me one of those! It just proves that even if your not perfect your still adorable. Love yourself anyway! I'm forever forgetting to sew things on when I sew, so I totally relate! I love love love it!! I wish I was that crafty! Since I haven't entered before. Looks totes adorable!! Earless only adds to it's perky little charm. Awww, to be honest, as much as I love the 'bot (by the way, does he have a name? If not, he totally should), I kinda like him without the ears. Makes him look more inquisitive. I would say it was Ear-responsible to forget the ears, but that might sound Ear-itable. Very cute ears or no ears. Those pouches are SUPER cute! I love your Steampunk posts! WV: (NO JOKE!) carkies - The purse could be a neat place to keep your carkies!!! Wow, with so many people entering, I'm sure I've got little chance. Who could pass up the chance to have the cuttest widdle wobot ever come live with her, no matter how small the chance? Oooh!!! So adorable! Pick me! Pick me!!! Please!!! Incredibly cute...even without the ears! I love the little Epbot robot! So cute on the coin purse! Yay I finally read Epbot on the day of a contest! Weee comment comment comment comment! With or without ears, still cute! He's got to be the most adorable bot out there! I think he needs a girlfriend...and maybe some cute baby bots! Me too! Me too! I love it! Count me in! Totally cute. Totally cute, even without the ears. There is just something about handmade that beats store-bought every time. 'Ear, 'ear! Yes, of all the ear-related humor in the world, I chose that one. Count me in. He's (she's?) too cute! [jumping up and down] Pick me! Pick me! Pick me!!! Very cute, just the right amount of nerd and girly. Still cute, even if it doesn't have ears! I'd love to give the coinpurse a new home! So cute! Oh my goodness, how adorable! I'm definitely going to have to grab my scrap bag and head over to that tutorial! All of the bots in the post are absolutely adorable! That's one ADORABLE coin purse! 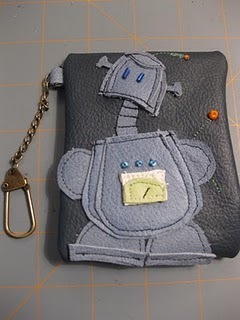 Adorable robot purses make the world go round! D'awwww. Too cute. And I'd LOOOVE to win. I need a coin purse too considering I lose all of my laundry money in the bottom of my purse. Wow! Both pouches are so cute! Men can use coin purses too, right? so without the ears does he bump into things because his radar sensors are out of wack? Without a doubt the cutest looking coin purse ever! That is so cute! I want one! Super cute! Perfect place to store my super secret cash/ coin stash for "fancy" coffee! Shh!! Don't tell the husband about my super secret stash!! Ohhhh he's adorable, even without ears! I would love to be able to give him a home!! 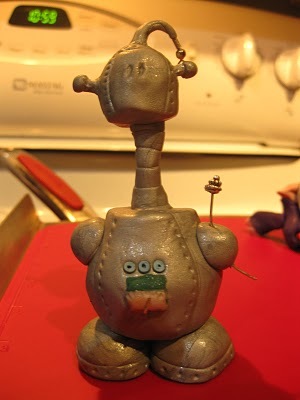 And that clay bot I just love it! Absolutely adorable (even w/out the ears!)!!! Such adorable Epbots :-) I would totally give that coin purse a good home. Even without the ears, the little coin purse is so cute. I've always loved your little robot guy. Just looks like he'd be fun to hang out with. Ahh adorable!! I'm going to see if I can combine the change purse craft with any of the smashed pennies crafts to make a change purse with actual change on it! I just so happen to be in the market for a change purse. This one is beyond perfect! GASP! Kacy want! <3 so cute. I work with special needs kids and he would so fit on my work bag! AHh! That is so cute! I hope I win! It's *adorable*! Love the look on its face. How cute! I love all these fun crafty things :) Excellent blog too! 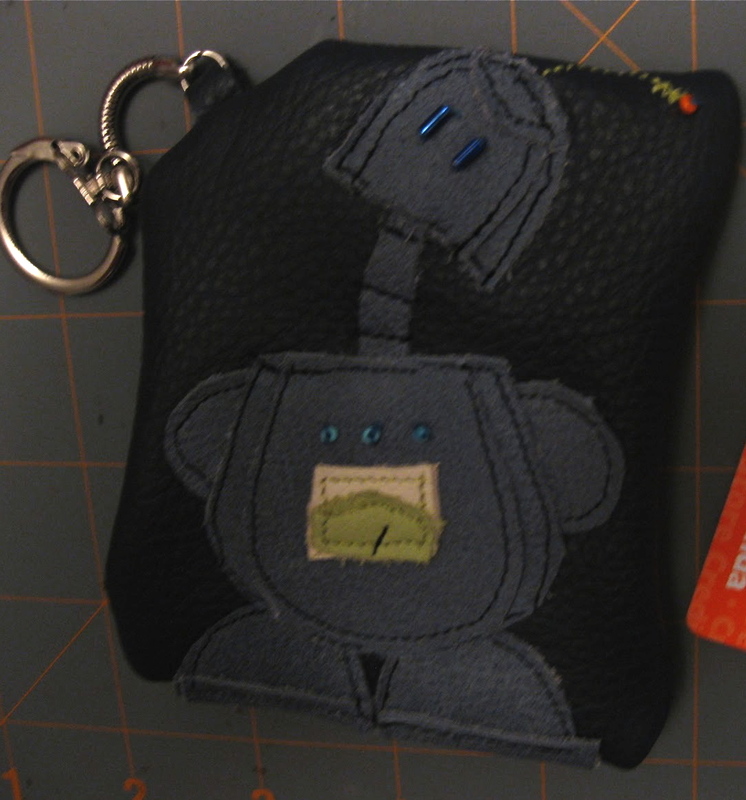 I would love to win any leather coin purse...the fact that it's Epbot just makes it better! That's adorable! I would love to own an earless Epbot. He's kinda head-tilty too, like, "Where mah ears go?!" ...okay, so he probably doesn't talk like that, it'd be more like, "10001101001110" or something. But eh. Sans ears is mega adorable! Hm... LEATHER and (sizing it up against my current change purse) just MY size! AWW! What a fantastic job! I even love it without the ears!!! Just love this little guy!